Happy Birthday, Disney Store, Where Our Romance Bloomed! 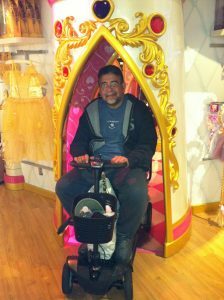 Ben liked scooting through the princess tower at the Disney Store in the Palisades Mall, NY! Today is the 30th anniversary of the Disney Store. Who would think of the Disney Store as a romantic date idea? We did, and that is exactly where Ben and I began our relationship. 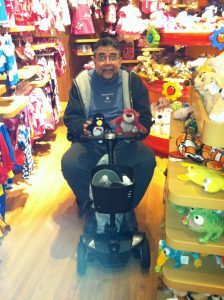 When we started spending time together, we always took a stroll through the Disney Store. We had so much fun looking at the toys and quizzing each other on Disney trivia. The flagship NYC store on Fifth Avenue was a special destination on our dates and we always looked forward to seeing new merchandise and exclusive NYC items. Ben knew that Disney was a definite way to my heart, and he expanded my Disney collection by many, many things! And, he always scored points by suggesting a walk to the flagship NYC store on Fifth Avenue. I miss that store- it was quite beautiful. But, wherever we traveled, whenever we found a Disney Store, we were happy shoppers! 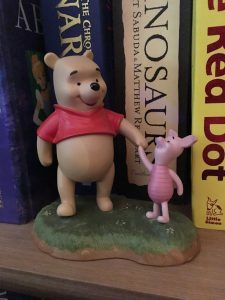 I think that my favorite memory of the Disney Store was walking through the flagship location one day and hearing, with great excitement, “Abby, look, it’s Piglet and his best friend, Pooh!” Ben had spotted the figurine in this picture. Piglet and his Best Friend Pooh! A very special figurine with very sweet memories. I laughed as he caught himself and jokingly lamented that he was macho before he met me (not so macho, trust me!) He later got it for me as a surprise and I treasure it for those memories. From that point on, we would always exclaim, “Look, it’s Piglet and his best friend Pooh!” whenever we spotted things with these two best friends. This figurine and memories of our sweet times at the Disney Stores always make me smile because it is a sweet reminder of this man I loved who was such a romantic and such a child at heart. It’s nice to think back to the very early, pre-ALS days of our relationship. 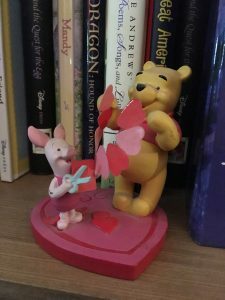 A Valentine’s Day gift from Ben with Piglet and his best friend Pooh! Firsts are always hard. The one year anniversary of Ben’s passing away. His first birthday that he wasn’t here to celebrate. My first birthday without him. Every “first” milestone has been a hurdle to overcome. The same can be said about my first solo travel jaunt to London earlier this month to celebrate my birthday. 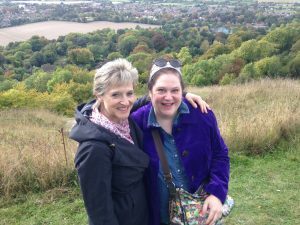 I was a very independent traveler before I met Ben, and London has always been a favorite place to go, especially because I have wonderful friends there. Since I never went there with Ben, I felt like I would not have constant distressing reminders of things we used to do together. I had such conflicting emotions as I made my plans- I was excited yet I did feel the alone-ness. Every reservation was daunting and decision-making was so difficult. Having been someone who enjoyed traveling by myself, it bothered me to feel that way. I do, however, have amazing friends here and in England, who supported and cheered me on in my planning. Landing in London and seeing the signature taxis was indeed exciting. Upon arrival at the hotel, the staff was very friendly and I said I was happy to be back. 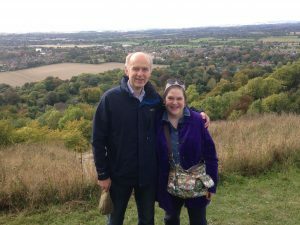 When they asked why I had not returned in a long time, I choked up as I said that my dad and my husband both had been ill. You just never know when the triggers of sadness will hit. 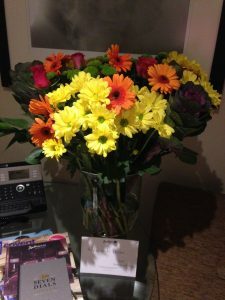 I went to my room wondering if I’d made a mistake and was not ready for this trip, but was greeted by a gorgeous flower arrangement sent by my friends. It brought a huge smile to my face and reassured me that I was not alone and I am fortunate in so many ways. The staff was also very kind and kept tabs on me throughout my stay, even when they saw me in the neighborhood after their shifts. There really are great people everywhere. I visited with my friends Penny and Jeremy the day after I arrived. It was wonderful to see them and it felt good to talk to them about Ben, and the good and bad times. It helped me see that I will always carry Ben with me as I continue to move through life. I do sometimes wonder if I dwell on the past to the point that I am not fully engaging in the present. But, I took a big leap by going away, and surely, that is a good sign that I’m doing better. Penny and I at Whiteleaf Cross. Jeremy and I at Whiteleaf Cross. How fortunate I am to have friends that are like family living around London! I’ve known Penny and Jeremy’s daughters, Eleanor and Florence, since they were babies and they will always be little girls to me, but it touched my heart to see what lovely women they have become. I was able to visit Eleanor where she teaches, in a most amazing school, Christ’s Hospital. Click here if you’d like information about his historic and fascinating school. I met Florence in the heart of London, where she is living my dream of living and working in London! Walking through London and visiting my favorite places, I found that I was looking at them through Ben’s eyes. I made mental notes of what Ben would like, and what he would say and do. I took pictures that I knew he would have taken. I have always loved the British use of language, and I know he would have chuckled as I took such delight in hearing the very well-worded explanations, directions and commentary. It was so nice not to hear constant cursing that I feel surrounds me in NYC, and I had to laugh that when I did occasionally hear it, the words were often coming from my own mouth! 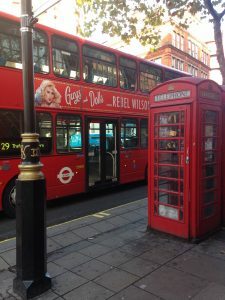 Ben would have photographed every phone box, mail box and double decker box in London! So, when I saw these together, I quickly snagged the shot! 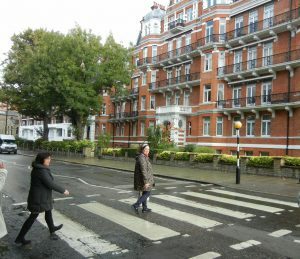 When I began planning my itinerary, I knew that at the top of my list would be a visit to the crossing at Abbey Road, made famous by The Beatles album cover. I had never done that before, but I know Ben would have loved it and I wanted to go in his honor. As I approached the crossing, a purple double decker bus also approached. Purple was our favorite color, and I had never seen a purple double decker bus before in England (and I only saw one other one on my last day in London), so I truly believe that it was a sign that Ben was with me. I understand that not everyone agrees with that thinking, but it makes sense and is comforting to me. 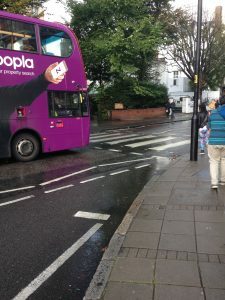 The purple bus that approached the crossing at Abbey Road as I arrived. I believe it was a sign! On the rare occasion like this, when I did want a picture of myself in the crossing, it is especially lousy, and almost embarrassing, to be alone, but I was grateful that some nice students were willing to snap my picture. The famous crossing! It really was a fun thing to do and extra fun because Ben would have loved it. 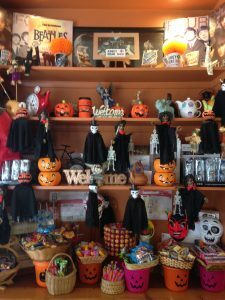 I found the Abbey Road Café (which is not on Abbey Road- go figure), where I saw that they had a Halloween display. Ben would have loved the combination of Beatles and Halloween things and would have taken photos, so I did, too. While sad not to have him there to enjoy it, I did feel that I was honoring him with every step I took. I needed to do that. Knowing how much fun it would have been for Ben, and that I’d gone there just for him, felt good and right. Of course, I had to visit the Disney Stores in London. I’d done my research, and I knew there were 3 in central London. I visited the first one in Covent Garden on my first day of wandering around. The emotions are always conflicting: excitement about being there knowing that Ben would also be so excited, yet overwhelming sadness and loneliness because, in fact, he was not there. At Harrod’s, I was so happy to find an exclusive Mickey Mouse toy. I walked proudly around the store hugging it and one of the sweet saleswomen chatted with me about this Disney Store within the landmark Harrod’s. I guess my enthusiasm was apparent, because before I left with my new Mickey and an Eeyore who just had to come home with me, she handed me a little card that said, “Have a Magical Day” and “My First Visit to Harrod’s Disney Store.” I could vividly picture Ben laughing about it the way he did when I waited on line for stickers with all the little kids at Walt Disney World. I often felt on the brink of tears, sometimes giving in to them and at other times finding a way to smile at the thought of how he would react. As I write this, I wonder if including thoughts of him in everything I did was a way of allowing myself to be happy on this journey. 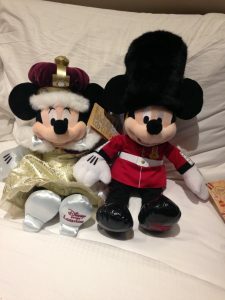 Exclusive Oxford Street Disney Store Mickey and Minnie. Quite regal, don’t you think? Exclusive Harrod’s Mickey Mouse! So adorable! I love Eeyore, and this little guy asked to come home with me. 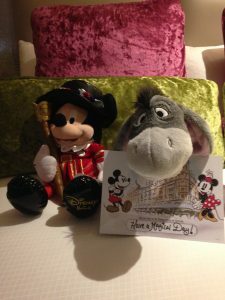 Eeyore is holding the card I was given marking my first visit to that Disney Store! I went to the theater and to the ballet almost every night, which is one of my favorite things about London. These are things that Ben enjoyed but that are my passion. I was even able to get a ticket to both parts of the very popular and sold out “Harry Potter and the Cursed Child,” which I consider an intervention by my dad and Ben! And yes, also my friend Ed, who kept telling me to stop by the box office. The show was absolutely incredible. Ben loved history and I know that he would have enjoyed tremendously the sights and sounds of this London. It makes me sad that we never got to visit this enchanting city together. I missed Ben’s company strolling the streets and neighborhoods of London even though I did feel like he was with me. I missed sharing favorite places with him. I wish he could have spent time with and gotten to know the friends he knew were so important to me. When I felt lonely, I did text and email my friends, who were totally amazing and supportive, as they have been throughout my entire experience with Ben and ALS and now, with grief. I have not completely given into happiness but I am now finally coming out the other side of the caregiving and loss. I have come to dislike the expression “moving on” because I feel like it implies leaving something behind. I’m not leaving Ben behind. I do “keep going” because I’m still here and that does come with some guilt. But, I hold in my heart who he was, and who we were together. Those memories and feelings came with me to London. They allowed me to gain a new perspective on the London that I love and to have a great time despite the emotional roller coaster. They will help to shape this new phase of my life. That thought actually gives me some peace and comfort and lets me look toward the future with growing confidence and optimism. 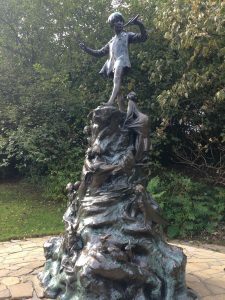 The Peter Pan Statue in Kensington Palace Gardens always brings a feeling of whimsy and magic. This time, it also brought a sense of hope.